Interlocutor: The life of the great Navigator Christopher Columbus is an entire historical enigma and I would like to unravel it once and for all since many people have asked me about him. Ruanel: Okay, you can begin. Interlocutor: In the first place, there are doubts about his nationality. Ruanel: Do you mean to the Genoese Columbus? Interlocutor: Master, you make me laugh with your fine irony. So he was born in Genoa, without any mystery. Interlocutor: How about his family? Was he maybe a nobleman? Ruanel: Cristoforo Colombo was born in a very humble family. Interlocutor: Master, you answered my question in advance, because my next question was related to his real name. Ruanel: Columbus - and we will call him by his name in English -, since he was a kid he was devoted to all that had to do with navigation. Interlocutor: Did he embody with the mission of discovering the lands that later on were called America? Interlocutor: In one of the books dictated to Ercilio Maes by the spirit called Ramatis I read that Columbus, in one of his incarnations had been an "Indian" in America. Is that correct? Ruanel: Yes, that’s right; he had been born in the Mayan culture, about 200 years ago, in the year 1200 or so. Interlocutor: Could that incarnation have influenced him so that he knew that new lands existed beyond the lands already known? Ruanel: In part yes, since he had visions and even dreams about it. Interlocutor: Obviously in his next incarnation he embodied as Christopher Columbus. Interlocutor: Concretely, what year was he born? Interlocutor: How was his personality? Ruanel: when he was a kid, he had some complexes since he was very short. Then he began changing, his structure became chubbier, he was very criticized about that. He didn’t like sports very much and he had many problems of self-esteem. Then he developed his intellect, studying the topic of geography especially. It’s not true what people say that in the culture of that time the Earth was seen flat like a page. Columbus knew with a total certainty that they won't fall outside of the horizon because he saw that the horizon was curved and that the Earth had continuity. Interlocutor: You mentioned that part of the impulse of navigating beyond the horizon came from those visions and dreams from a previous life. What was the other part that impelled him? Ruanel: The other part that impelled him was his own thetan. Interlocutor: Now I understand. I suppose that the Masters of Light also suggested him ideas in his causal body. Is it right? Interlocutor: When his ideas of navigation began? Ruanel: Around eight years before he truly did it, but always, for one reason or another, the trip was frustrated. Interlocutor: Were there maps at his disposal? I ask it because the historians speak a lot about this possibility. Ruanel: There were maps, but they were incomplete. Columbus knew with all certainty that there were new lands because his thetan was constantly dictating to him and he even knew that there were ices in the south. Interlocutor: Definitely, Columbus was a great medium. Ruanel: Of course. That is the source of his tremendous conviction. Interlocutor: That’s clear. But how about the maps Didn’t they give him also assurance? Ruanel: No, not at all. In that time there was no map that could give him the slightest certainty that there were other lands. Interlocutor: But Didn't he have in his hands the maps of Piri Reis? Ruanel: The maps of Piri Reis are subsequent to Columbus death, therefore they could never have been in his hands, the real maps of Piri Reis were incomplete and they didn't show new lands. Interlocutor: Are you telling me that those maps are false? Ruanel: The maps that are attributed to Piri Reis are not those that he drew, because they were redrawn by other cartographers who added other geographical data that were already known for sure. Interlocutor: The map of Piri Reis that I show you and I got from Internet, Is it false then? Ruanel: Correct. I repeat that the original maps of Piri Reis were completely lacking they didn't indicate new lands at all. Interlocutor: Well, I admit that I didn't expect this. In fact I thought that Piri Reis had had some extraterrestrial contact. Ruanel: No, not at all, his maps were modified by other cartographers. It is as if I sketched with some few lines a face and then others came and completed the eyes, the nose, mouth and ears. Interlocutor: I understand. So, Piri Reis didn't make any fraud. Ruanel: No he did not. Interlocutor: Definitely, an entire false history was weaved about those maps. Ruanel: Totally. They are not the original maps. Interlocutor: So that there is no doubt, when the cartographers modified the maps of Piri Reis they added geographical data they already knew with certainty? Ruanel: Exactly. That is the absolute truth. Interlocutor: More fraud, impossible. 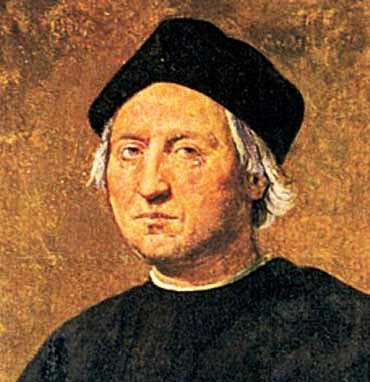 Could not Columbus have any visible map that gave him the certainty of something? Ruanel: Correct. The certainty of Columbus came fundamentally from his Higher-self or Thetan. Interlocutor: What you say is absolutely categorical! Ruanel: I emphasize that the discovery of Columbus is only his merit. Interlocutor: Well. I won't insist more because I consider this issue properly clarified. Another point that is questioned is regarding to the place where his remains rest. Are they maybe in some place in America? Ruanel: No, they are in Europe. Ruanel: Near to the place he was born. Interlocutor: But why this place is unknown? Ruanel: Simply because they didn't give him importance in that moment. Interlocutor: The answer was quite obvious. And if somebody wanted to locate his tomb at the present time? Ruanel: It would be impossible to find it. Interlocutor: Will the researchers adulterate the DNA tests deciding that Columbus's remains are these or those? Ruanel: I don't have the slightest doubt. Interlocutor: Is it Something similar when they exposed the alleged Hitler’s remains? Ruanel: It’s not the first time that they falsify the facts. Interlocutor: And which country will probably keep the credit, false of course, of having Columbus's remains? Interlocutor: To finish with this issue, how old was he when he died? Ruanel: He was around 70 years old. Interlocutor: Is the historical date of his death correct, May 19 1506? Interlocutor: In which country did he die? Interlocutor: And after that his remains were transferred to the place where he was born. Interlocutor: In the same moment of his death? Ruanel: No, they were transferred some time after. Interlocutor: Do you confirm that with regard to Columbus and his discoveries the extraterrestrials didn't have anything to do? Interlocutor: Well, there are many people that will be happy with this because they affirm that we include extraterrestrials in everything. Ruanel: I want to highlight, before to conclude with this topic that if one went to some museum to see the dimensions of the ships that crossed the Atlantic Ocean, he would be amazed by their small size. It was really an entire prowess. Interlocutor: Were they really so small? Ruanel: Yes, they were. It’s difficult to think how they could sail the sea with those ships. Interlocutor: Did Columbus leave some testament? I ask it to know if he had a great fortune when he died since it is another questionable topic. Ruanel: No, he didn't have a great fortune. Interlocutor: Did he die poor? Ruanel: Not completely poor, but what he had was not enough to leave big things in his testament. Interlocutor: Why so much mystery has appeared where there is no mystery? Are the spirits of error behind? Ruanel: The spirits of error are always there, but also add the Ego of the incarnated being that sees a mystery everywhere. Interlocutor: There is an investigator from Ibiza called Nito Verdera who says that the discoverer of America was a native from Ibiza. Ruanel: It is only business. Interlocutor: Did he make up everything to sell the book? Ruanel: Partly yes and besides his decoder hallucinates. Interlocutor: Should I add him to the case of the spirits of error? Ruanel. They are always present when the possibility of distorting things exists. Interlocutor: During his voyage, Did Columbus see extraterrestrial ships? Ruanel: He saw lights, and he knew positively that they were not from this world. Besides, he confirmed it when he arrived to his destination because the natives insinuated him, from the beginning when they could communicate with him that they had seen taller and blond "gods." Interlocutor: Did Columbus intuit that they were extraterrestrials? Interlocutor: It is true what he recorded in his writings that he saw mermaids and he found them quite ugly? Ruanel: Yes, it is true. They are the same type of mermaids that you have in your web page. Interlocutor: And sea monsters, Did he also see them? Ruanel: Yes, but they were extraterrestrial holographic projections. Ruanel: To discourage the trip. Interlocutor: What was the reason? Interlocutor: I understand. Is there something more about Columbus? Ruanel: No, because the fundamental thing is this. Whosoever wants to find out more, he can appeal to history books, but those that are serious, not those that invent myths to make money. Interlocutor: To conclude, How did Columbus persuade the kings of Spain to make his trip? Ruanel: He showed them outlines, he spoke of possibilities to them that the world was circular and that it could be much easier to travel to Eastern countries by sea. He had many doubts on this subject, because in his intuition, the revelations of his thetan, he had the certainty that there were new lands, but in his rational mind, his earthly common sense - let us call it like that-, he thought that he will arrive by sea to the East, without traveling thousands of kilometers by land. Interlocutor: Do you mean the famous phrase “to colonize the Indies"
Ruanel: Correct. In fact Columbus thought that the Earth was smaller. Interlocutor: So when he arrived to land, Did he think that he had arrived to the Indies? Ruanel: Actually not, because during the trip he realized of the immensity of the Sea and the same world in fact, he realized that there were other lands in the middle that didn’t belong to the same fringe of land from where he had set sails. Interlocutor: It is clear. Did Columbus have a strong character? Ruanel: Yes, he truly had it. Interlocutor: By the way, Was there some mutiny on board? Ruanel: Yes, the sailors tried to revolt twice because they thought that they would sink, especially when there were storms. Interlocutor: The voyage was not easy for him then. This entry was posted at Monday, October 12, 2009 and is filed under History . You can follow any responses to this entry through the .